Located close to the Urubamba Valley known also as the Sacred Valley, in the Anden Mountain range, in the southeastern region of Peru, Cusco has been the capital of the Inca empire during its apogee and it’s now one of the most visited city in Peru attracting over 2 million visitors per year. Her vicinity to the sacred valley and being the getaway to all the tours to Macchu Picchu probably helped to reach its fame, although it is indeed a charming and interesting city with a lot to offer. As a matter of fact, it’s been recognized World Heritage Site by UNESCO and for good reasons, starting from Cusco Cathedral towering over the beautiful plaza and the surrounding historical buildings. 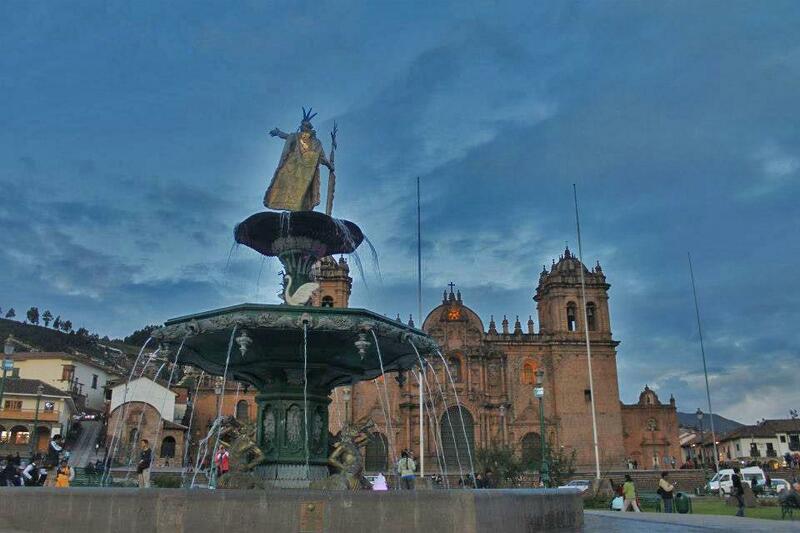 You can easily visit a large number of interesting sites on day trips from Cusco. We will see all of it and more in this post. Here below I have created an index to help you navigate through the guide. If you wish to have it printed please let me know and I can send it to you. 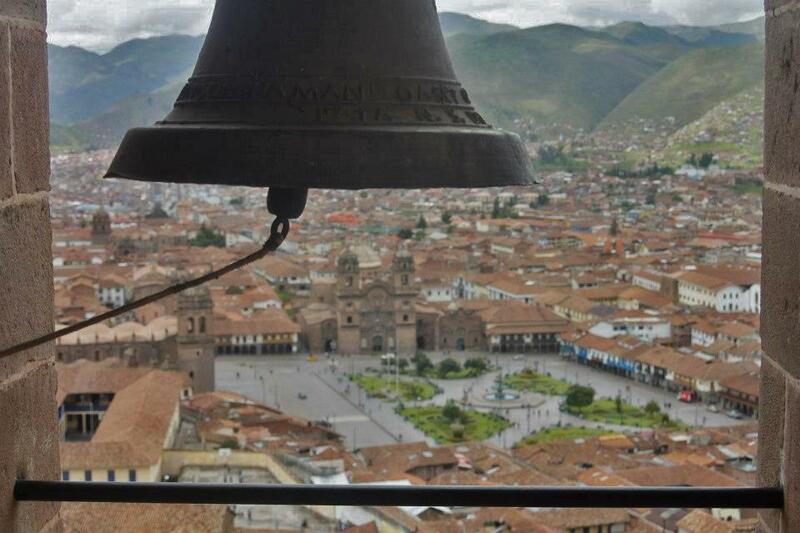 I was in Cusco in March 2013 for 3 weeks. At that time I had no specific plan in mind besides hiking to Machu Picchu on the Inca trail, which you have to book in advance for the limited number of people they let in at a time. The following 2 weeks were still left to the hazard although I had in mind to do some more hikes and all the other amazing things to do in Arequipa. While I was recovering from my jet lag in one of the cute cafe in Cusco, feeling already the negative effects of the altitude in Cusco (4000mt), I was thinking about the people I met on my flight there. All of them on a charity mission. I thought how cool would that be to do the same while I am here. I started to search and after a lot of bureaucracy I booked my 2 weeks of voluntary work, that would have started after the hike. I was excited, although I missed my other hikes, I felt I did something good, helping and teaching kids from a nearby town. But that’s for another post. During a weekend when the school was closed I managed to plan a quick tour to Puno and visit some islands on the lake Titicaca, of which I will talk about here. Fast forward 5 years I am now on an eternal journey through the world and this year will be dedicated to discovering South America. 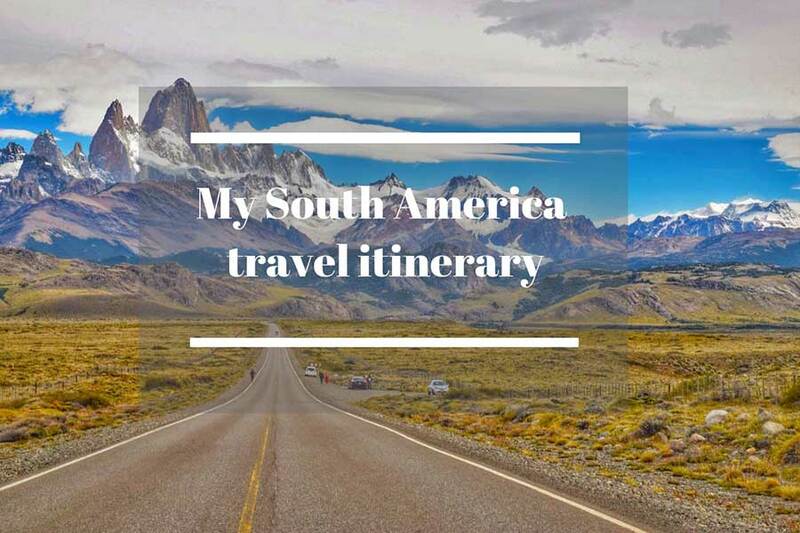 As I am planning my trip in these days I am checking out all the most beautiful places and unmissable spots and decided that Peru must be included for sure and Cuzco as well. 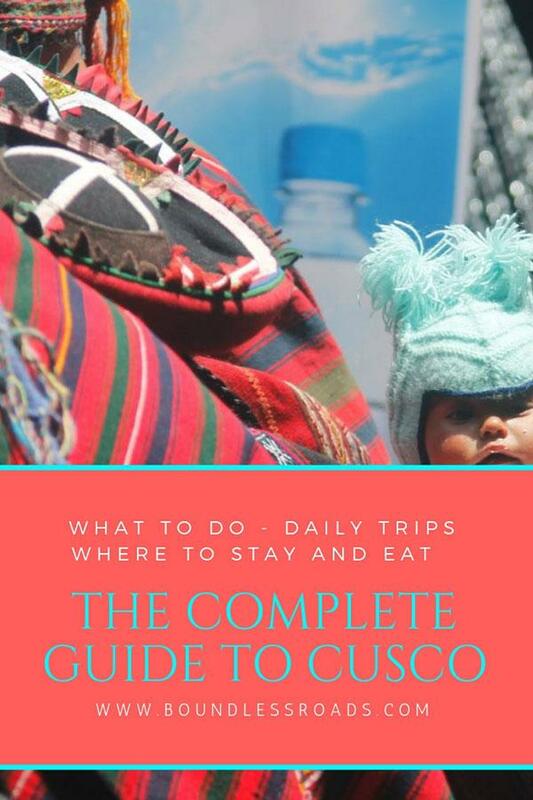 Although I don’t normally like to go back to places I have seen, there are so many day trips from Cusco that I couldn’t do at that time and I decided to include them in my new itinerary. I need to remember though, that altitude in Cusco is 4000 mt (12000 feet)and that’s not a joke. I had altitude sickness problem and I was 4 days with a terrible headache and no Coca leaves or coca tea would help. But as soon as you can get over the altitude sickness it’s paradise. 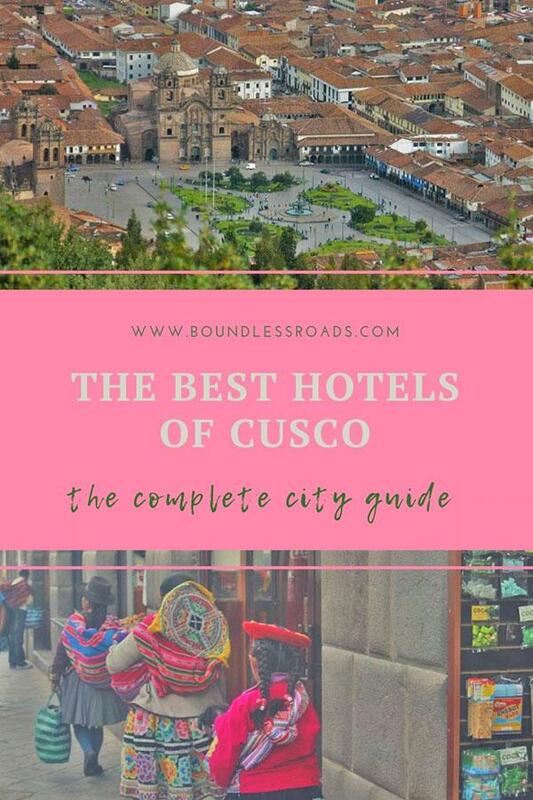 In this post, I will talk about the beautiful touristy city and the best area to stay in Cusco, what to visit, where to eat and much more practical information you need to know. Although Cuzco is mainly famous for being the gateway to one of the worlds seven wonders Machu Picchu, the most important archaeological site of the pre-hispanic population of the Incas, the charming city attracts flocks of tourists from all over the world who enjoy its vibrant historical center, its historical buildings, fancy restaurants proposing the delicious local cuisine, the narrow cobblestone roads and much more. Here is what I have enjoyed during my trip and also what I am planning to see when I will be back in a couple of months. It’s unmissable and inevitable as the huge plaza is the beating heart of the city. Terraced bars and restaurants surround a squared manicured garden, where locals and tourists hang out sitting on the iron benches or walking around. Sometimes street performers offer interesting shows as well. Right on one side is the beautiful Cusco Cathedral which is also worth a visit. Although we cannot forget that the Cathedral raise on the remainings of the old Inca temple, destroyed by the Spanish conqueror, and has been built by the sweat and blood of the indigenous population, we cannot deny it’s magnificence and the beautiful example of gothic architecture with some baroque influence. It is interesting to notice how the Incas incorporated some of their religious symbolism such as the carved head of a jaguar in the doors. The Jaguar is, in fact, an important god or religious motif found widely through much of ancient Peru but also among the Mayan culture in Mexico. Admire the numerous artifacts in the such as a unique Peruvian touch in the replica of Da Vinci’s ‘Last Supper’: a cuy (local guinea pig and food delicacy – for some) appears on one of the plates. TIP: The normal price to enter the cathedral is $25 SOLES (USD $8) during the normal opening hours from 10 am – 6 pm. However, if you go during mass hours, it is free. You can spend an entire day browsing through the colorful stalls of the huge market where they sell absolutely everything. I was especially intrigued by all the spices, candles, and various instruments used for spiritual healing. It’s fascinating. I had to buy a special tobacco there for a Mexican shaman who was a friend of mine. It was a long massive tube made of tobacco. I was so scared to be stopped by immigration when I entered Mexico, but it all went well and eventually, the shaman told me that nothing would have happened to me because I was carrying the tobacco for positive and noble reasons. It made sense actually. If you are not too sensitive you will notice entire cow heads, hanging chicken and other macabre scenes that I would have been happy to avoid, but hey. it’s part of the culture. Fruits and veggies stalls were the nicest giving so much color to the entire scene. A lot of food vendors as well if you want to try the local street food. Barrio means neighborhood in Spanish. San Blas is on the quaintest corner of the city and one of the best places to stay in my opinion. Situated at 10 minutes walking distance from the city center, the picturesque parish is where you will find the most interesting artifacts, cobblestoned narrow roads, lined by cute little cafe’ and local restaurants. 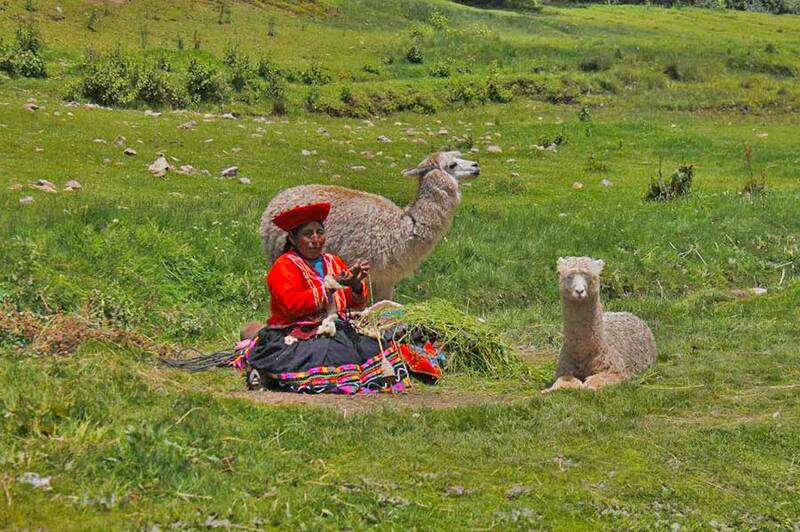 A lady and her son will walk with a lama to offer a picture for a few soles. I didn’t take it, but it would a certainly make a great Instagram picture, although of doubtful ethics. I still need to figure it out though. I was still vegan at the time (now I am 80% vegan and 20% vegetarian) and I wasn’t certainly interested in trying the roasted cuy, guinea pig and a local delicacy. I can’t even think about that. Although if you don’t mind they say is good. I went for the Quinoa soup. You can have it with chicken or vegan. I had it vegan and it was delicious. If I am not wrong Quinoa is an endemic cereal cultivated in Peru and they make it in many different ways, but the soup is the best. 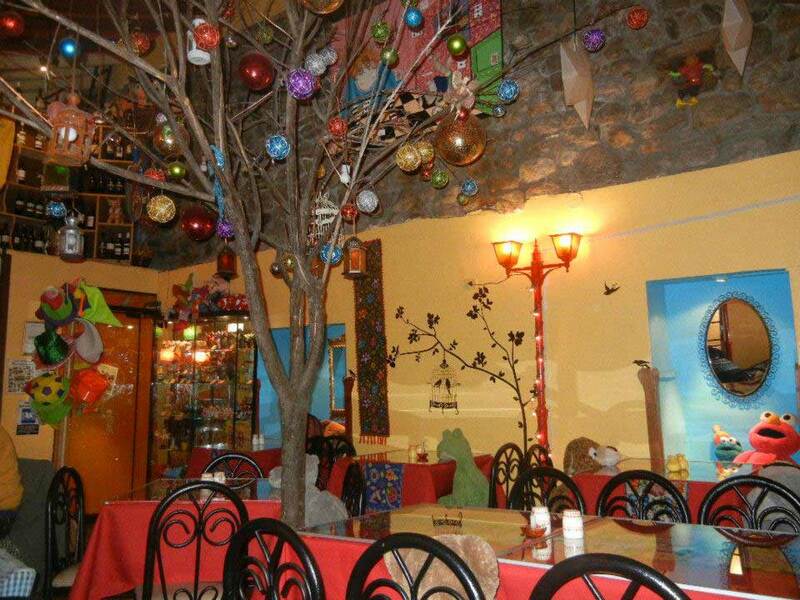 I will tell you where in the below section on the best restaurants in Cusco. The Peruvian ceviche is worldly famous and the Inka Cola is a super sweet soda which I didn’t really like but worth tasting it just for the sake of information. My favourite quinoa soup in my favourite restaurant whose name unfortunately I don’t remember. Sorry. 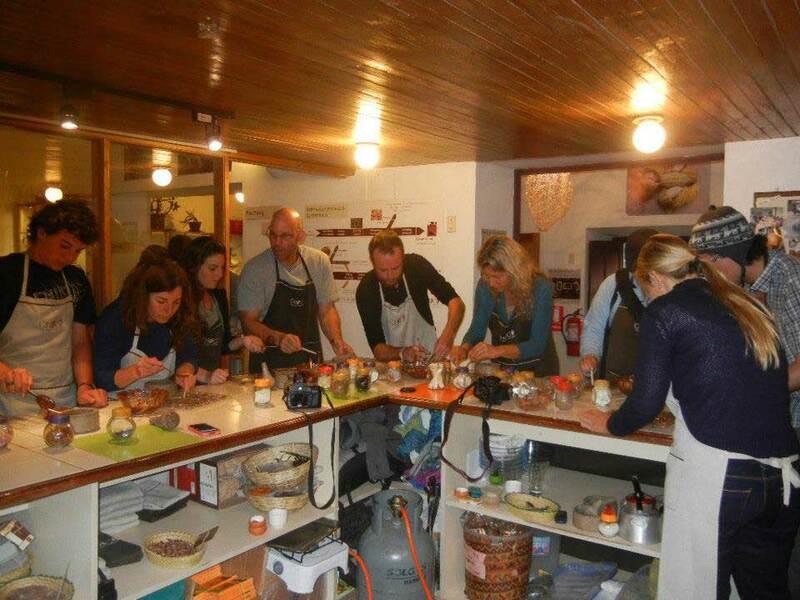 I had a blast in the Cacao Museum, where they organize workshops on how to make chocolate. So much fun and you got to taste your own product as well. It’s also a good way to make friends. You can either book your class on the spot or prebook it here. There are many bars where you can hang out in the night with good music and great drinks, of course, you need to try the Pisco sour. I am not a drinker but I loved it. 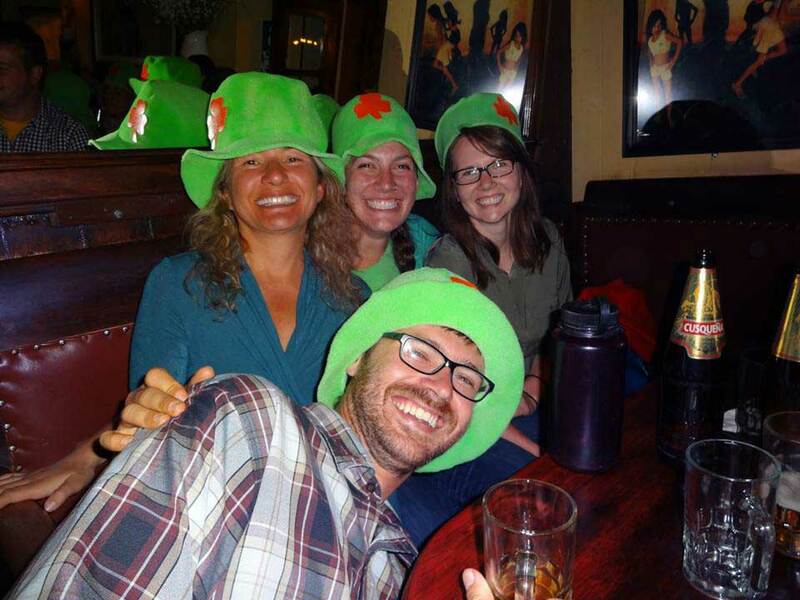 I was there for St Patrick day and I went to the Irish pub Paddy’s, right at the corner by Plaza de Armas, to celebrate with my Inca trail hiking companions, we had a blast. 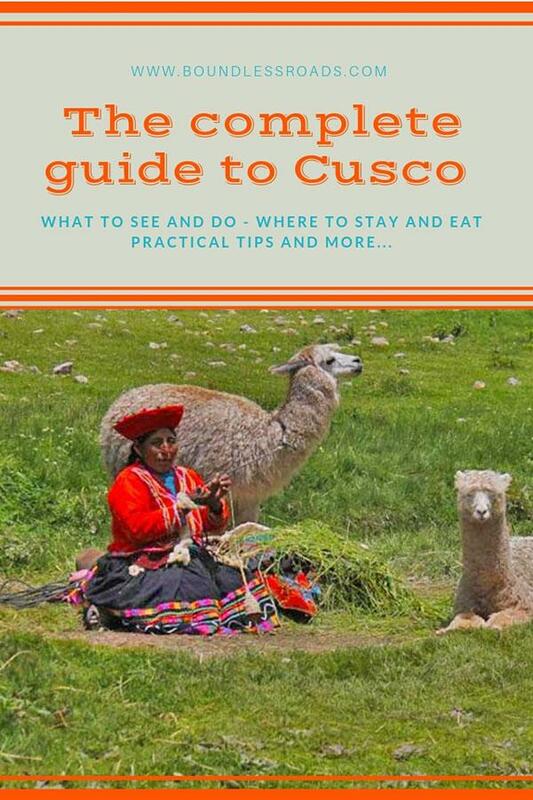 For more options on the nightlife in Cusco, it’s better if you check out this guide as I am not much of an expert on nightlife in general :). This was not there during my visit and I can’t’ wait to check it out. 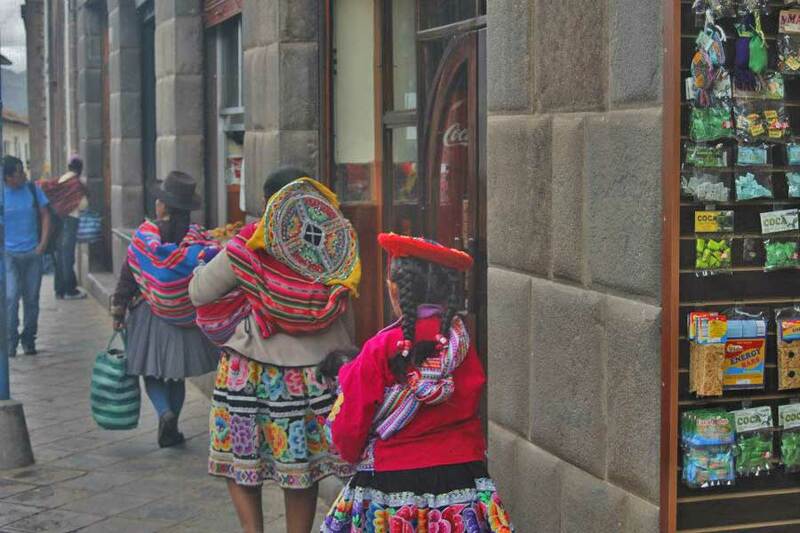 It’s a family-owned project which has the purpose to educate locals and tourists alike on the ancient Inca knowledge about the stars and planet the power of their influence on our earth. 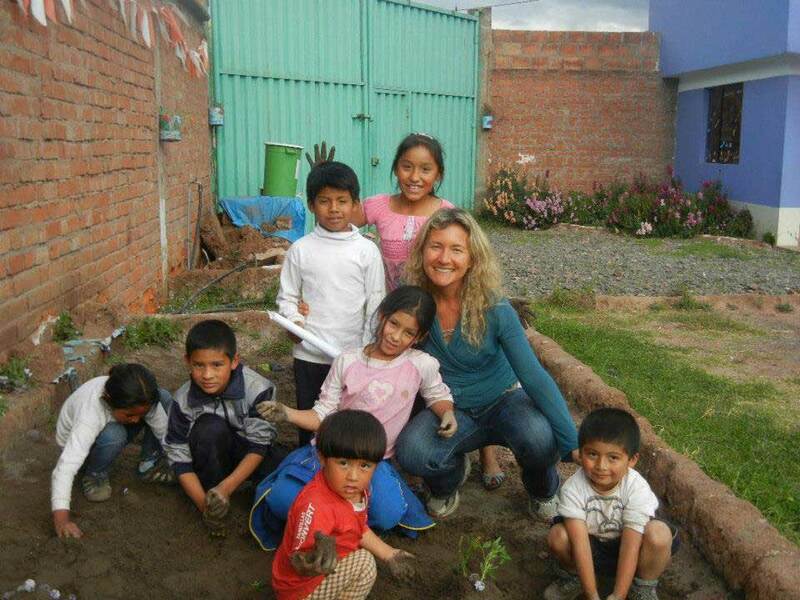 They have different options, private and group tours and also great initiatives with kids. You can check their site here. It’s five minutes walk from the main square and you can’t miss it. 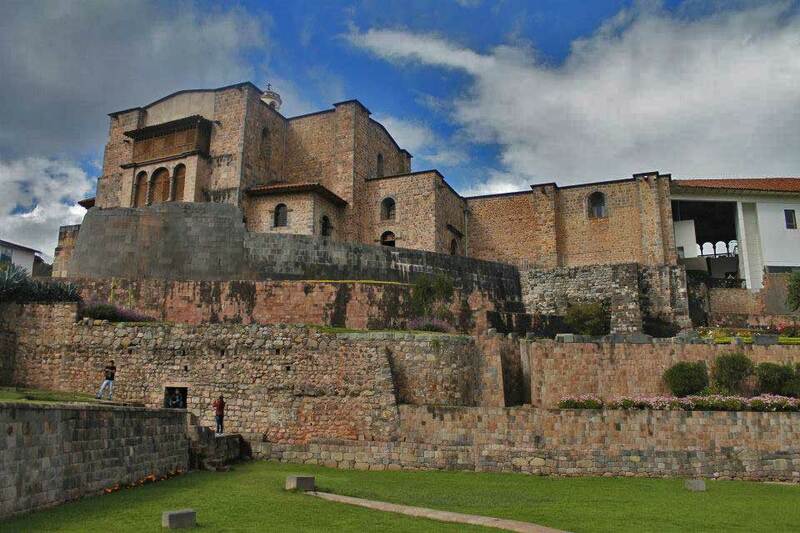 A piece of history, the heritage of the ancient Inca civilization and an example of their perfectionist architecture. The stone is presently part of a wall of the palace of the Archbishop of Cuzco. Since 2012 for 6 years in a row, Peru ranked first in the world travel awards as a culinary destination. They must be doing something good. So why don’t take some cooking classes and learn from the best? You can check out different options of cooking classes here. If you want to learn a new language it’s always a good idea to do it in a place where they speak the language so that you can practice and it’s twice as much effective. Many people decide to merge a vacation with an opportunity to learn. I did it when I wanted to learn English in England and Spanish in Spain and I will do it when I get to Brazil as I want to learn Portuguese. It’s exciting, especially for the opportunity to mingle with the locals in their own language. Everywhere I go I always look for a walking tour or a bus tour when available and I schedule it on day one or two as it helps to familiarize with the city and get to know interesting tips from a local perspective. And sometimes you also make friends. NOTE: Normally there are free walking tours available but you are always required to leave a tip. So it’s not properly free. NOTE #2: There are also paying tours which are longer and include some of the archeological sights in the vicinities of Cusco. Before booking make sure you check what’s included in the tour. Ask your hotel how to book this tour. If you don’t feel like walking there are several bus tours available that offer a 2 hour guided tours around the city covering all the major sights of to Cusco. You don’t have to do anything, just sit back and relax while listening to the guide and looking at the colorful historical city. One of the companies I have heard of is Cusco Sightseeing Bus. This is probably one of the most meaningful construction in Cuzco and among your priorities, if you are short of time. Inside what is now the Convent of Santo Domingo you can admire what remains of the old Inca construction– the Temple of the Sun (Qoorikancha), the most important sacred temple in the Inca civilization. It was covered with gold and precious golden statues were erected within its beautiful courtyards. Just like it happened for many ancient precious buildings even the Temple of The Sun has been demolished by the Spanish conquerors and replaced by the convent built by the Order of Santo Domingo. I always love to enter in all the churches I see, be it for a second or for more, depending on how I feel at the moment. I love to check out the architectural details but also to take a moment of reflection and give thanks for my life. It doesn’t matter what religion you are. I am not even sure whether I am Catholic or not and I would do it in a synagogue or any other sacred place when they inspire peace and meditation. 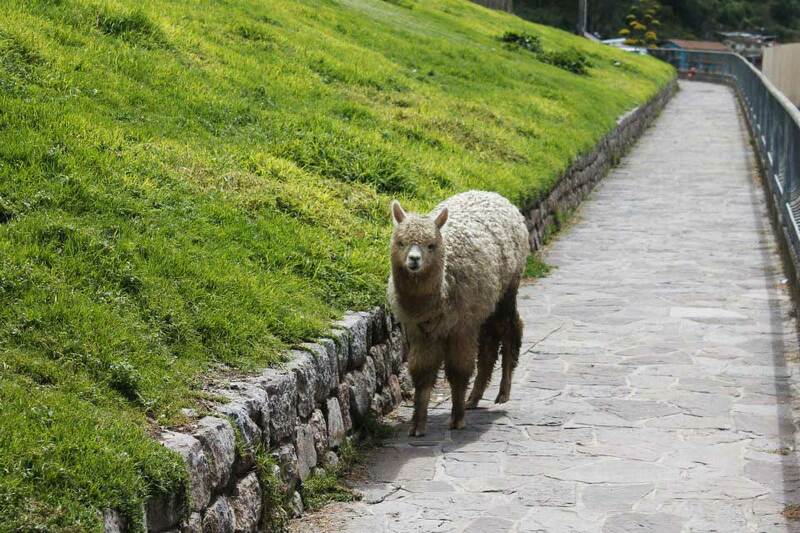 NOTE – at the time I went to see the church of San Cristobal there were a few lamas hanging out freely in the garden just by the church. It was hilarious. I just sit there and watch them for a while and suddenly they started mating. Obviously, I took some pictures and just as obviously I lost them. 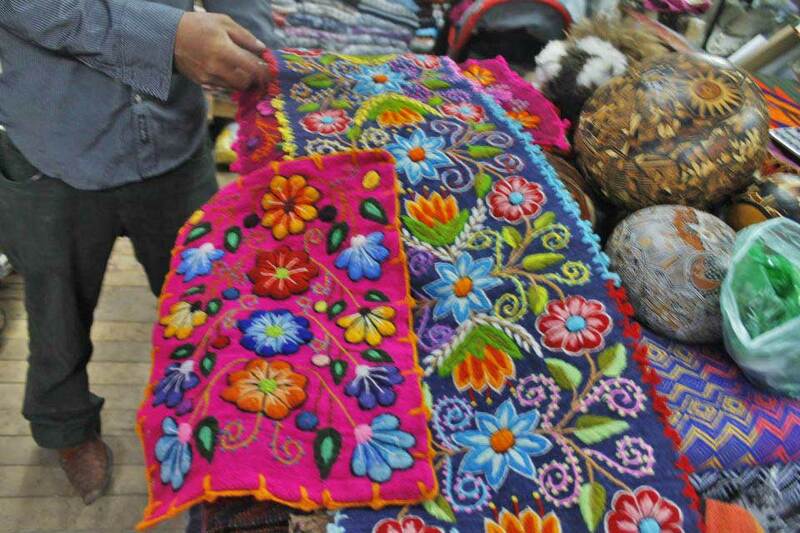 I love the colored artisanal clothing and textiles in Latin America from Mexico to Guatemala and also in South America. They are all quite similar and yet very different in many ways. You will find them a lot. If you walk along the Avenida del Sol, the main avenue, you will see a lot of shops some of them have the finest pieces of the local art. Yield to the temptation to buy them. You will bring a piece of the Quechua tradition with you and will help the local population to keep their tradition alive. 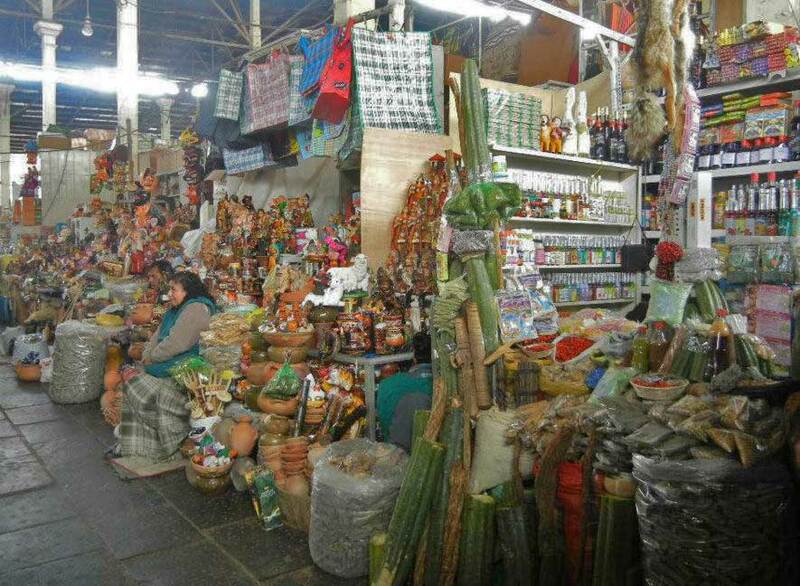 You will also find local street vendors selling their own homemade artifacts as well, maybe even cheaper but still original. 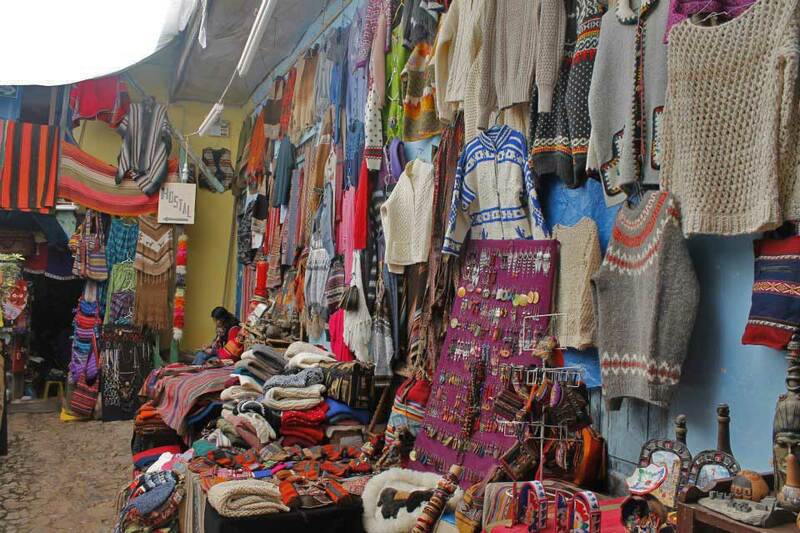 On the way from Pukamuqu to Saqsaywaman, along with the nice walk in the woods, there is a big local shop with lots of pieces of textiles and artifact. I remember they also had 2 sweet local dogs (Viringo Peruano) that I saw for the first time. 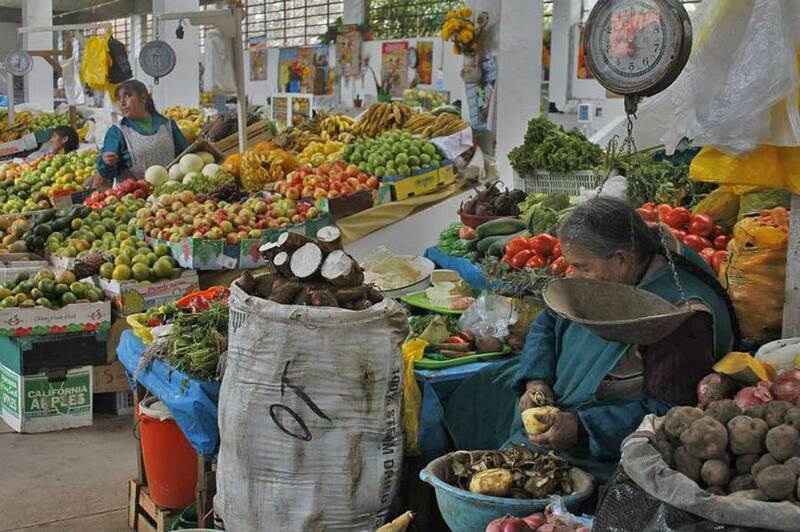 If you love markets and you find San Pedro too touristy, you can check out Wanchaq Market, tiny and very local. I am going to write an entire post on this since I have contrasting feelings about it. I did it and I felt good about it. However, I am not sure who gets the most benefits if the kids or the companies, which should be no profits, but they actually are. I feel that sometimes they hide behind the “charity” name to make more money. And I don’t think they should ask volunteers to pay in order to help them in the first place. We volunteers already do our part by… volunteering, why do we have also to pay? It just doesn’t make sense. However it is also true that these charity company need money more then volunteers’ help in order to run their company and help those people in need. Most of the time the volunteers’ work do more harm than good. This article will explain more about it. Also what about those kids that see you 2 weeks and then you disappear? what do they take out of it? I would love to know your thoughts with regards to this topic. In the meantime, I am doing some research and I will write something on it soon. If you want to help though, just make sure you chose wisely. The Museo Inka is where you want to go if you are interested in learning about the Inca history and the Spanish brutal invasion. One of the few museums without an entry fee, in the museum Quechua you can appreciate artifacts, painting, and photos related to the local culture. The name Quechua refers to the language spoken by Peruvians, Bolivians, and Ecuadorians but also to their culture and traditions. of archaeological objects from cultures pre-Inca and Inca, as well as a select collection of colonial paintings that shows the success of the artists from Cusco. Located in Plaza San Francisco is what was previously a church, it’s quite a fascinating museum if you like religious art. All the artwork and decoration are dedicated to the life of San Francisco. The entrance fee is 15 soles and includes a guided tour. One of the highlights is the Belltower with stunning views. Remember that Cusco altitude reaches approximately 4000 mt and the locals are used to chew coca leaves to fight the sickness. Well, it didn’t work much for me but the so popular plant has been used all through the indigenous populations of South America for its curative powers for many different kinds of diseases and also for sacred rituals. In the museums, you will see how it’s been used and abused in the history of times. I haven’t been there but I will go next time for sure. It should be very interesting. 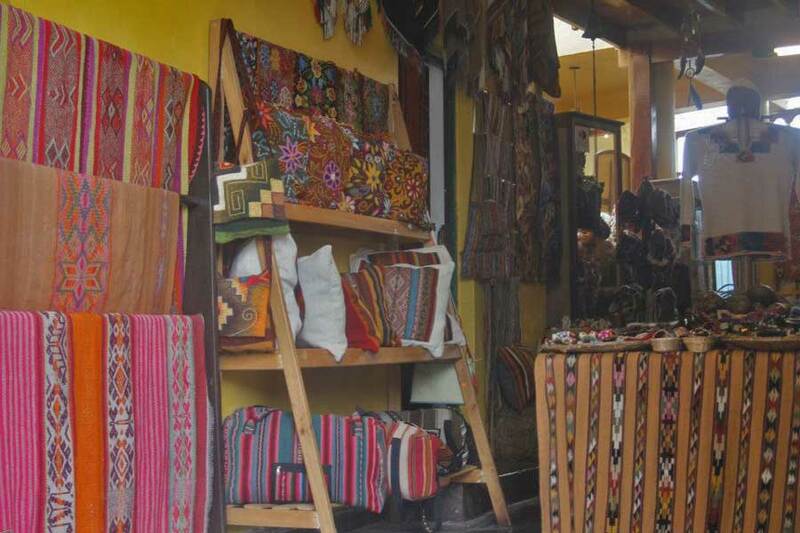 It’s more a shop than a museum and it’s dedicated to the local art of weaving. It works as a non-profit organization which helps the native village communities to keep their traditions alive and the 70% of the sales of the shop is presumably directed to them. Located at the end of the Avenida del Sole coming from the center, it is about 20 minutes walk. The monument is made of a tower and the statue of the greatest Inca emperor Pachacutec on top of it. The entire museum is dedicated to him to honor his greatness as it was considered one of the most important figures in the history of Peru. The best visionary, planner, strategist, reformer and organizer of his time, he’s considered an icon of the Peruvian Identity. It is said that during the inauguration of the monument three eagles flew above and three auspicious rainbows appeared one above the other pointing towards the great glacial mountain Ausangate. The surreal scene suggested that the great emperor is still living in the hearts of Cusco today. This museum is also interesting for being within the city town hall. 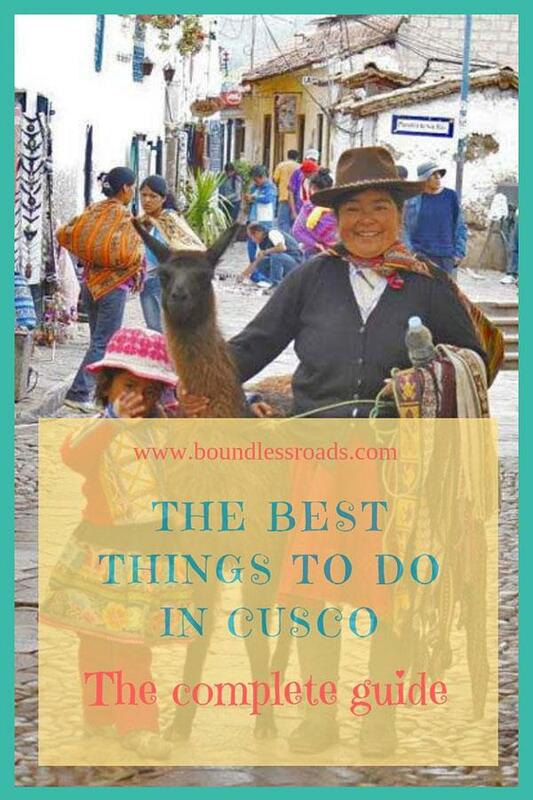 If you haven’t ever heard of it, you will in Cusco as they advertise it everywhere as if it was the most common and commercialized thing in the world. Instead, you need to pay good attention. It’s not a joke and not for everyone. It’s a ritual that is supposed to have a tremendous healing effect, cleaning your body and soul from the rubbish from the past and transforming you into your real being. It would be all amazing if it was not for the huge business they have built around it and, consequently, lots of scammy people are offering the “service”. I was offered an ayahuasca treatment of 3 days for 500 USD! Crazy. The real Ayahuasca ritual is assisted by a local shaman who should be willing to perform it for free or a small offer because he does it for the sake of spiritual vocation and not to become rich. In order to have effects, it must be executed and assisted by experts and “elected” people who know what they are doing. On the contrary, if it’s not done properly it can have horrible negative effects on you. After all, it’s a real drug and not a light one. Therefore if you want to do it, do your homework and research very well and make sure it ’s the real thing. If they ask you lots of money and they are foreigners I would stay away. But also in case you find a cheap one, investigate about the supposed shaman, ask around and listen to your gut feelings. 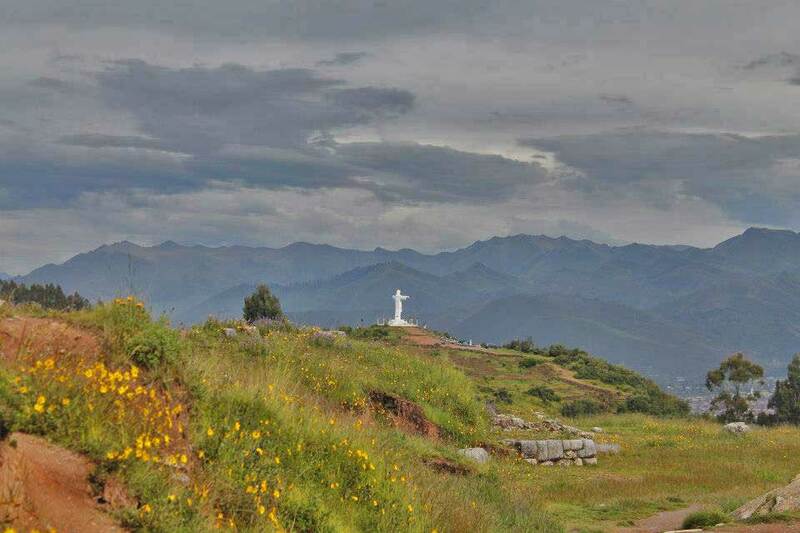 There are several day trips from Cuzco that you can choose from, all of them exciting and entertaining. Here is I list of what I did and also what I will do in my next trip in a few months. Cusco is known before everything else the getaway to the exhilarating Machu Picchu. Whether you go through a trek or by train, the launching hub is Cuzco. 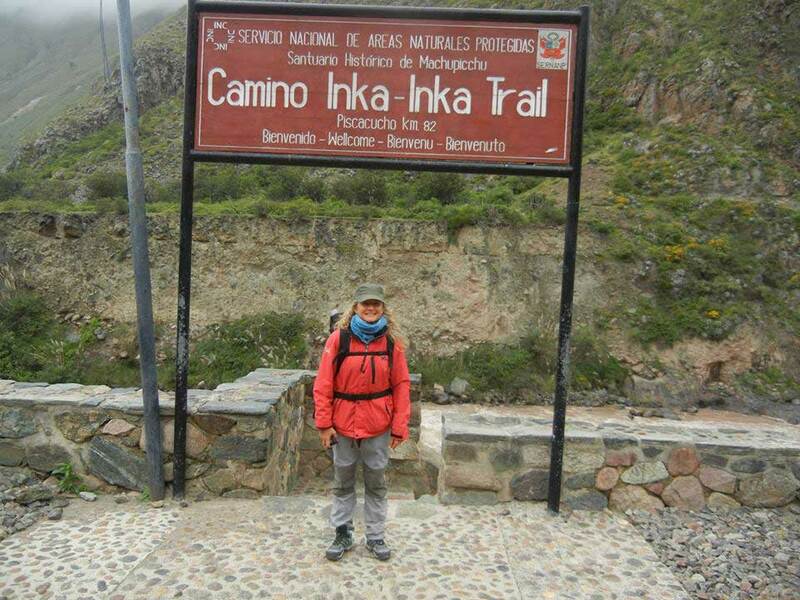 I did the most common Inca trail, the most expensive and most demanded. At the time I didn’t actually do lots of research and I thought there was only that option to hike there. 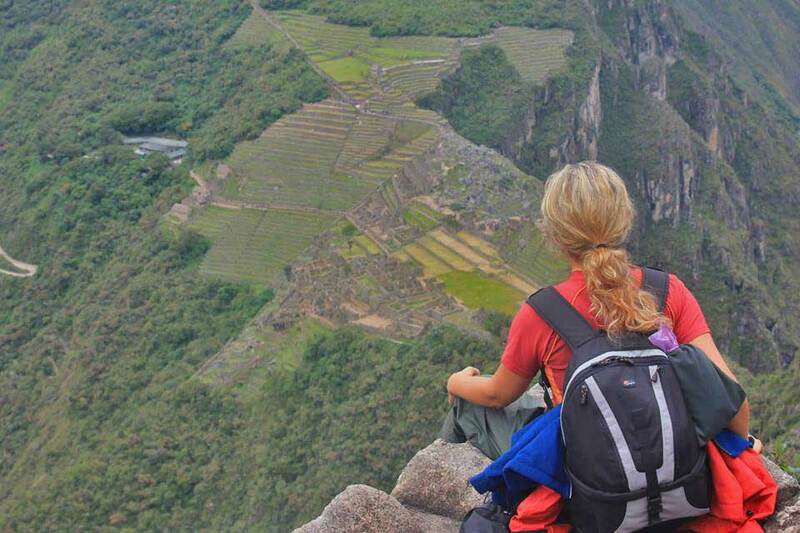 Nowadays I realized how many ways there are to hike to Machu Picchu. 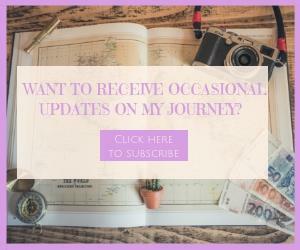 I’m telling you all about it and all the options you have to get there in this post. Also if you wish to read about more practical tips and when is the best time to get there, you should check out this post. Saqsaywaman, Qenqo, and Pukamqu passing by Cristo Blanco. Puca Pucara, which is also known as the red fortress as it’s uniquely red from the iron contained in the rocks. It served as a guard post to check out the flow of people entering the city. It’s in fact on higher points compared to the other sites. Tambomachay which is known as the Inca Baths. It’s made of canals, aqueduct, and small waterfalls that can be seen throughout the site and make it a suggestive natural park to walk through. As you can see from the map below, you can see them all together in one day. I took a taxi to Tabomachay, the farthest and highest and after I visited the small, but the pretty archaeological site, I walked my way down stopping by in all the others, until Saqsaywaman, the most important of the 4 sites, an amazing example of the precise ancient Inca architecture. A side note, on the way there I met a girl who was traveling by herself like me and we decided to walk together. We are still friends after 5 years and even if we live in different places we go and see each other every now and then. These are the beautiful things about traveling, especially if you are on your own and more open to encounters. I went to Pisac the day after my strenuous hike to the Inca trail, just because it was Sunday and I didn’t want to miss the colorful market. I took the best pictures there. Despite the fact that I chose to travel in the rainy season, it was a beautiful sunny day. I jumped on a combi (local transportation in a minivan) and got to the touristy Pisac, There I got a cab to take me at the archeological site and I walk my way down through the amazing ruins and nature. I was almost alone and sometimes I got a little scared to get lost. But That’s just me. The path is clear and you meet people hiking up every now and then. Once I arrived at the market I had a sumptuous lunch in a lovely coffee shop nearby and then I started to walk around the colorful stalls with the beautiful local textiles, jumpers and shirts, the fruits and many other items. If you are a portrait photographer that place is for you. The beautiful faces of the kids playing or hanging from their mother’s shoulders in their colorful clothes are just a pleasure to watch. I am not good at stealing pictures but I managed to take a few, which I lost… of course. It’s a visit that you can totally do on your own, don’t really need a tour. However, if you have a limited time available, a full day tour to the sacred valley will be convenient, as you cover more sites in one day. You can check it out by clicking here. Ollantaytambo is a touristic village and home to another Inca archaeological site. It’s manly popular because from there you would take the train to Machu Picchu or you would start your hike. Historical note: here the Inca won a battle against the Spaniards, unfortunately only the battle. 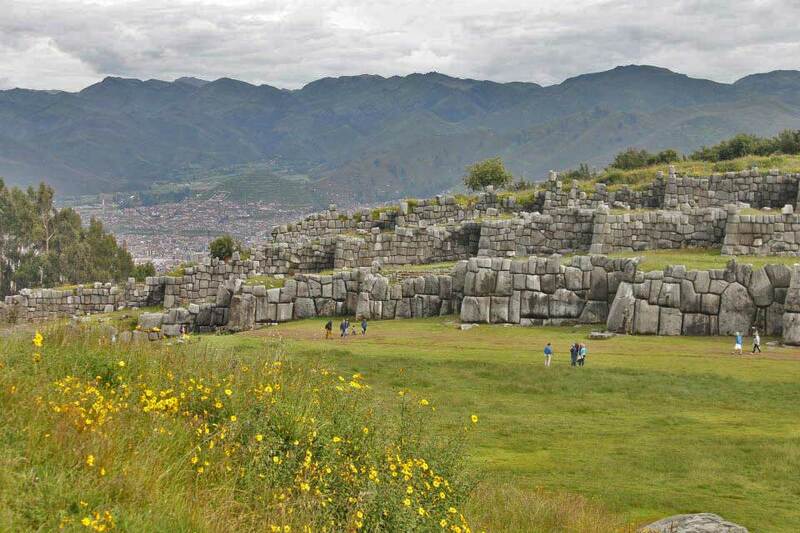 Located in the Southern Valley of Cusco those are the most popular ancient ruins among others in the area. 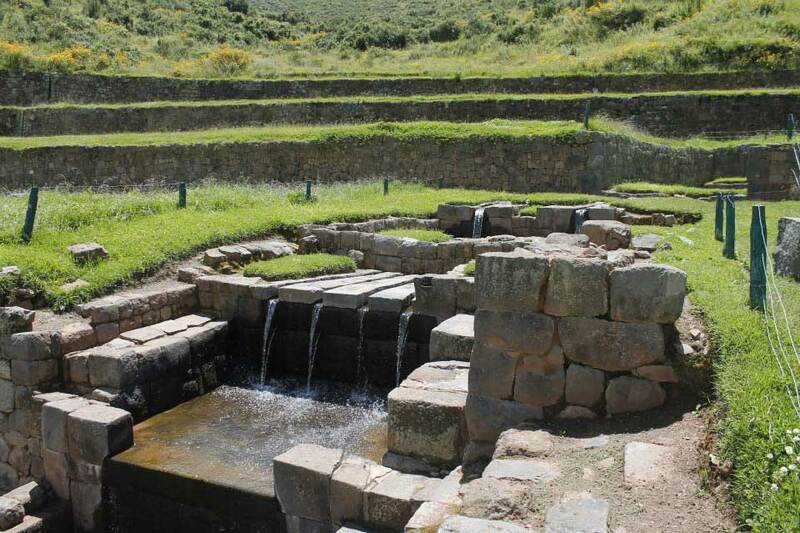 It’s a place where the Inca worshipped the element of Water. In fact, you will see a lot of little canals, streams of waters fountains, all connected in a remarkable hydraulic engineering system. 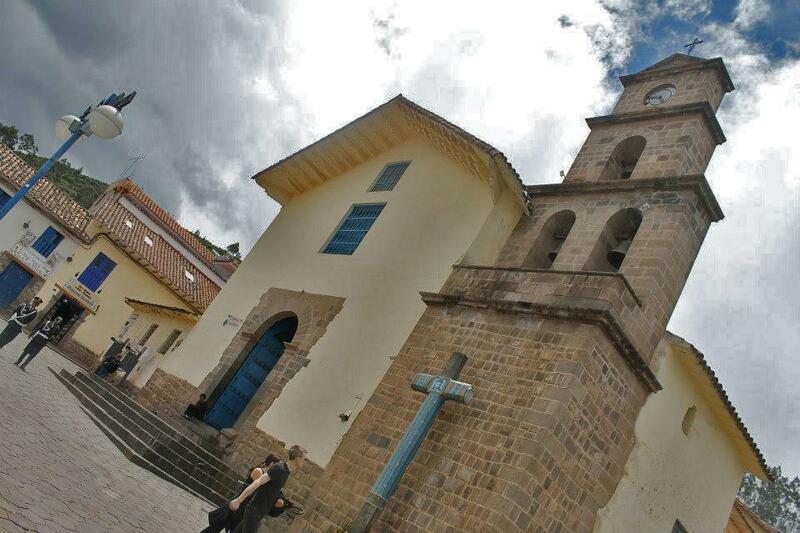 I visited it during my 2 weeks volunteering in Cusco as it was close to the little town where my school was. A masterpiece of gardening architecture. They say that the green amphitheater-like terraces were like an agricultural lab for the Incas where they performed experiments that resulted in the more than 3000 varieties of potatoes in Peru today. If I remember well there are organized biking tours around the area. They take you from Cuzco to thereby minivan until there and then on a mountain bike adventure around the picturesque region. Fun! Travel agents take you to Maras and Moray altogether on regular tour by minivan for only 25 USD. Click here to book your tour. Another spectacular site to visit. A vast reddish carpet made of thousands of cascading pools of ancient salt deposits. Besides the historical interest, it is definitely one of the most Instagrammed places in Peru. No wonder why. I can’t wait to point my camera on it. I will tell you how to get there as soon as I go myself. If you wish to do the same tour but by quads, you can also have this option, by clicking here. If you want to splurge you can book a couple of night on the Skylodge, it’s a surreal lodge made of glass capsules hanging from the wall of the mountain. I am not sure if I could even sleep there. The view must be amazing. I might do it in my next life. Jokes aside, I saw this lake when I was checking out pictures of the Salkantay trail, an alternative and cheaper way to hike to Machu Picchu, and I literally fell in love, so much that I was almost ready to repeat the hike to Machu Picchu just to see it. Now I just found out that you don’t need to take the entire tour. 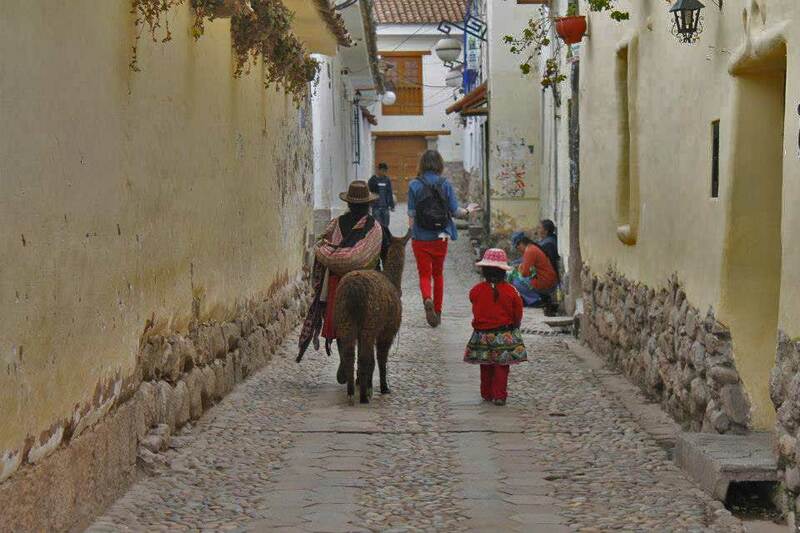 There are daily trips from Cuzco that take you there. 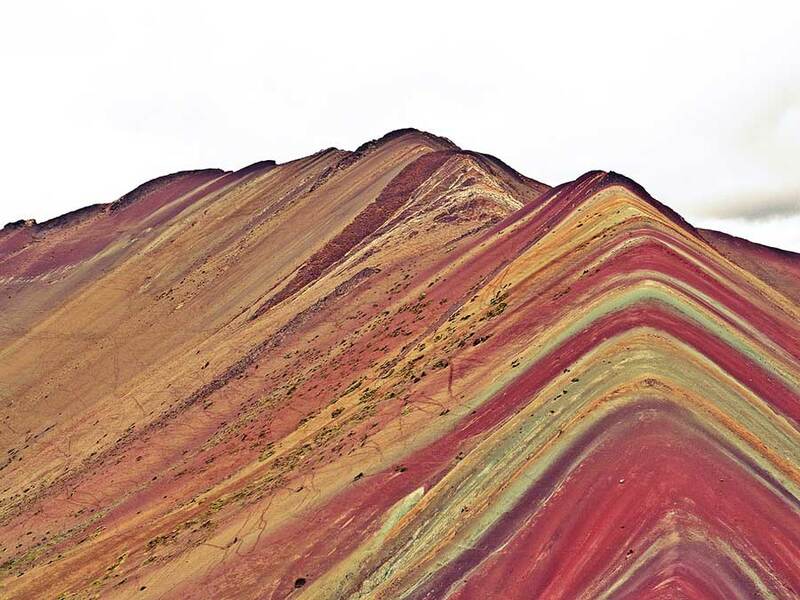 The Rainbow Mountain is another Instagrammed spot in Peru, after Machu Picchu. It is part of a trek I am planning to do from Arequipa. But I have also found out that you can also take a one day tour from Cuzco. I will definitely do the complete trek. I will tell you how it goes. If you have a limited time and wish to do the Rainbow mountain in one day, you can book it by clicking here. 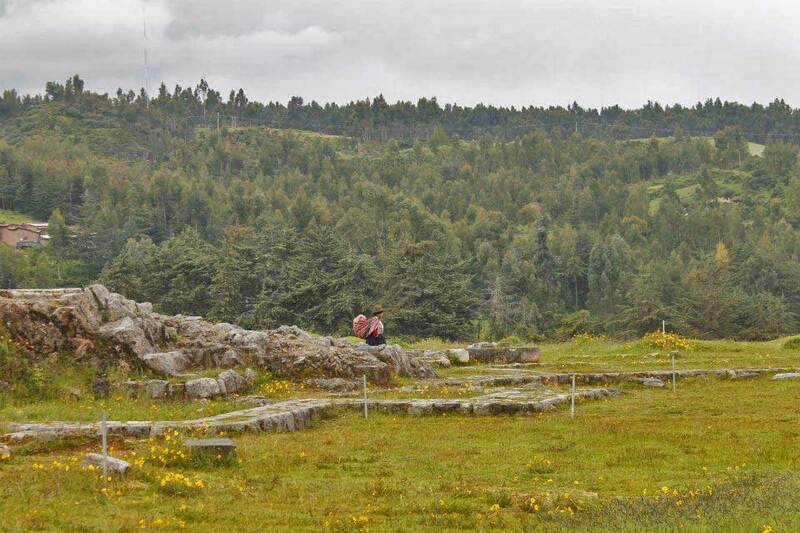 Right behind the ruins of Sacsayhuaman is a trail that leads to a large rock with a cave called the Chakan Cave, from where you have a stunning and scary view of the valley. Apparently, you don’t need a guide to get there but I will check it out as I don’t like to hike on my own in isolated places. It’s never a smart idea. I am intrigued by what I have read about the place, though. It’s like a natural monument as the rock wall seems as if it has been painted in different colors and as I will be going in rainy season I might be lucky to see a waterfall. I am glad I remembered the name of the place I was staying, I actually had it written in a post on Facebook which actually saved all the pictures of my trip to Perú, that I thought I had lost. The hotel is called Corihuasi and it’s the perfect option if you are traveling on a budget but still love to stay in a cozy place with your private room and bathroom. On top of that, the hotel is located a few steep steps to the main Plaza de Arma in a renovated XVIII century colonial-style inn. The rooms are very simple but clean and spacious. The highlights of the hotel are the amazing rooftop views of Cusco historic center and free WIFI. The inn features parquet floors and colonial-style furniture. There are colonial decorative details and scenic Spanish galleries with a seating area featuring a fireplace and overlooking the city. Click here to check availability and make your reservation. Click here to read the flattering reviews. However, like a real hotel freak as I am, I made some time to check out other hotel options, as the city center is full of charming boutique hotels located in old colonial buildings and most of them are worth mentioning. I stumbled upon this hotel while checking out others and I couldn’t help but be captivated by its unique style. I love the classic feeling overall and the elegant decorations all taken care of in extreme detail. The color combinations and the vintage furniture with modern touches. The patio is also one of a kind, full of plants and artfully laid out. It definitely has my vote. If you chose to stay in the funky barrio of San Blass I found this hotel to be the best option, with an old feeling but still very modern and elegant is what I call laid-back luxury. Chic but not pretentious. The austere rooms with parquet floors and raw wooden furniture make your stay comfortable and cozy. Casa Andina is another great option for those travelers in search of a stylish place with all the comfort and some sophisticated charm but without frills. The cute hotel offers accommodation in central Cusco overlooking Limacpampa Square, with traditional, courtyard-facing rooms. Located at a short walk from everything. the hotel offers cozy rooms built around colonial-style courtyards with wooden balconies. To check rates and make your reservation click here. This is the best hotel in Cuzco by the reviews of the guest but also by UNESCO who declared the precious luxury property a world heritage site. 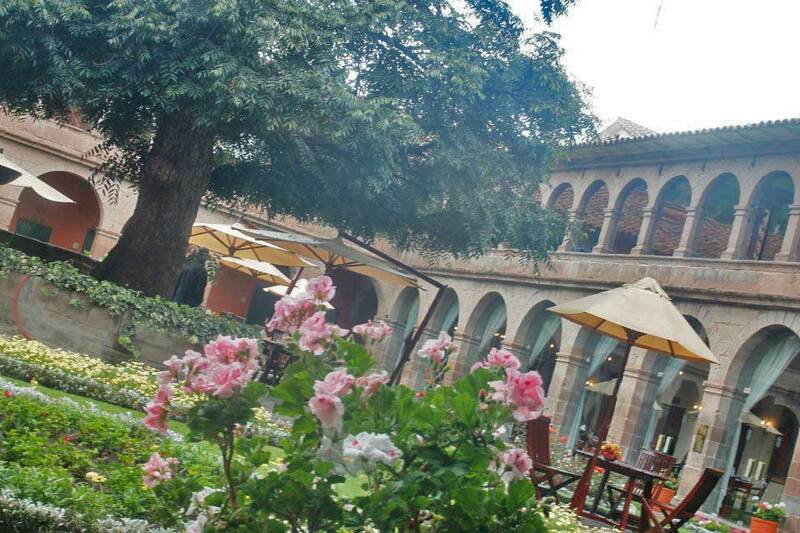 Located in the heart of the city, Casa Cartagena Boutique Hotel & Spa Cusco is the result of years of restoration of the ancient house whose original design has been loyally preserved. It’s the perfect combination of the Incan elements like the precious stones with the warmth of the colonial architecture. An intimate refuge consisting of only sixteen ample and homely suites which blend to perfection modern and ancient, luxurious and historical. The exclusive suites are distributed symmetrically surrounding an inspiring patio. A superb holistic spa is available to rejuvenate and soothe your senses after a full day exploring the region, and a fine dining restaurant to suit the most sophisticated palates. Click here to know more and make your reservations. Click here to read the amazing reviews. From a Marriott Luxury Collection, you couldn’t expect anything less. Another preferred hotel by the sophisticated traveler who loves to be surrounded by the finest amenities, and a luxurious and comfortable environment even when they set off for an adventure. Walking around the elegant rooms of the hotel including public spaces and the manicured courtyards is like walking into history, with precious stones and antique pieces of furniture contrasting exceptionally modern features and brightly colored wall. Here is where history meets luxury. Imagine living in a Monastery, surrounded by thick ancient walls impregnated with history and culture and glittered with beauty and luxury. Belmond is a guarantee of excellence. 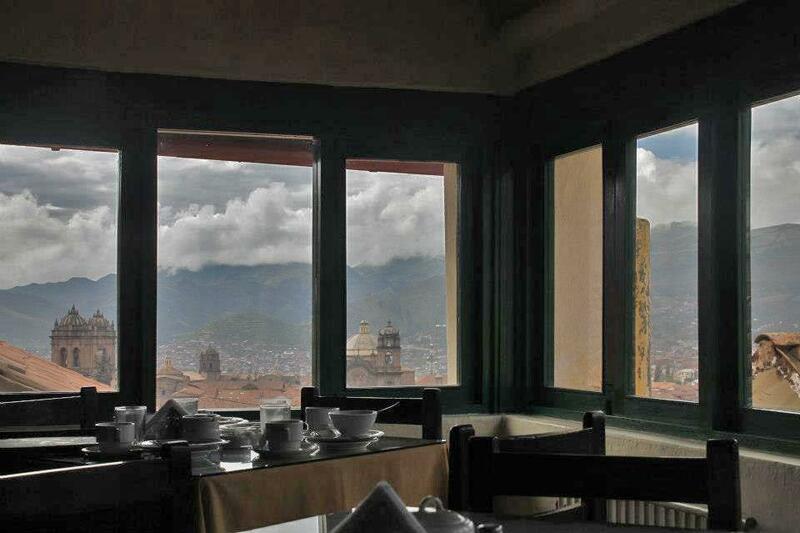 Be reassured you will have a lifetime experience in their unique hotel in Cuzco. They know how to make it magic. It goes without saying that the dining offer is top notch as well. Click here to read the extraordinary reviews. For the stylish and design sensitive crowd JW Marriot is a perfect choice. The elegant layout is the result of a perfect blend of modern luxury and the romantic old feeling. The finest amenities and the exceptional Peruvian hospitality make it the perfect option for the most demanding clientele. Disclaimer: I haven’t personally tried the restaurants while I am writing this. I am just doing some research and basically creating a bucket list of the restaurants I want to try when I will be in Cuzco. Unfortunately, I don’t remember the names of the places where I went and loved. However, bear with me as I will be back in a few months and will update the post. I would still trust this list anyway though. Very cozy and laid back environment it’s popular for the homemade beer but also worth trying the artfully made and well-presented dishes. Vegan, vegetarian and gluten-free options. 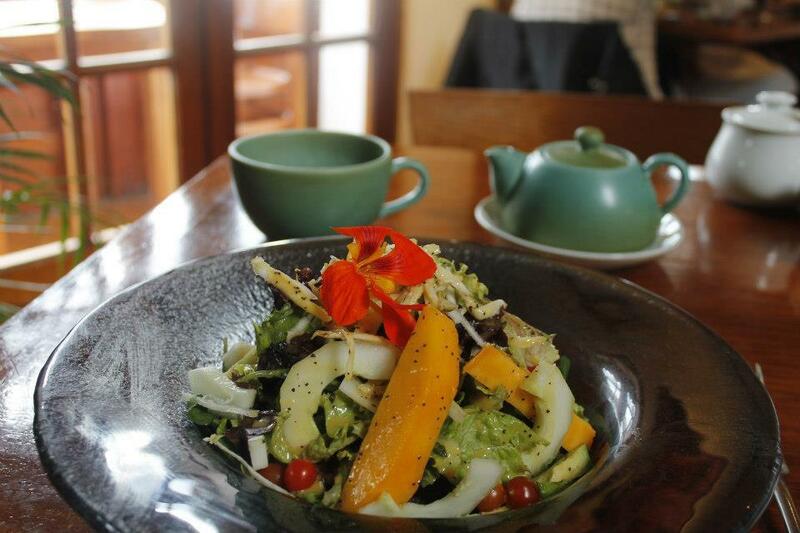 Great food with an amazing terrace overlooking the beautiful Cuzco. Fancy dishes with artistry decorations. Vegan and vegetarian options available. Can’t wait to hit this place. The vegan dishes look so creative and made with love, which makes a huge difference. 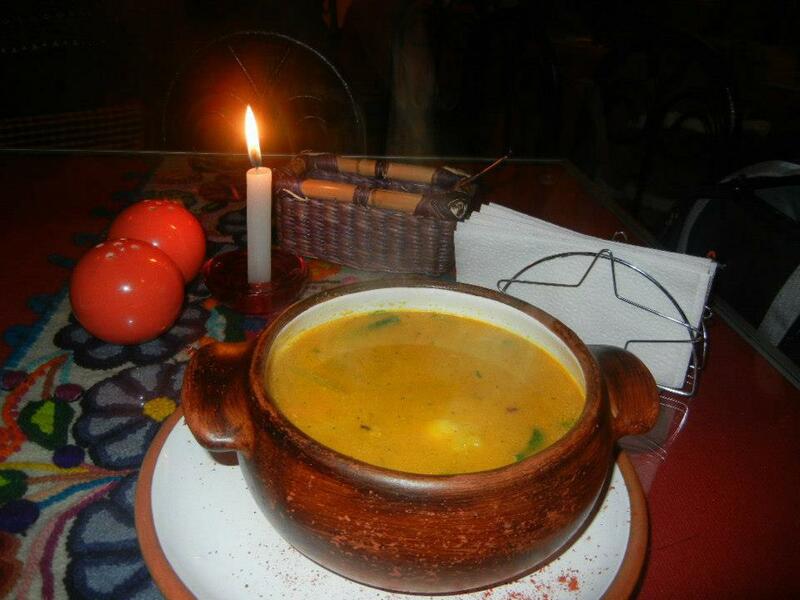 My favorite restaurant in Cuzco, offering the best quinoa soup ever. Unfortunately, I don’t remember the name. It looks cozy and warm with beautiful paintings on the walls. The dishes look amazing and inviting. They have vegan and vegetarian options. The dishes look amazing, so inviting. They have veggie options and guests seemed all very happy. 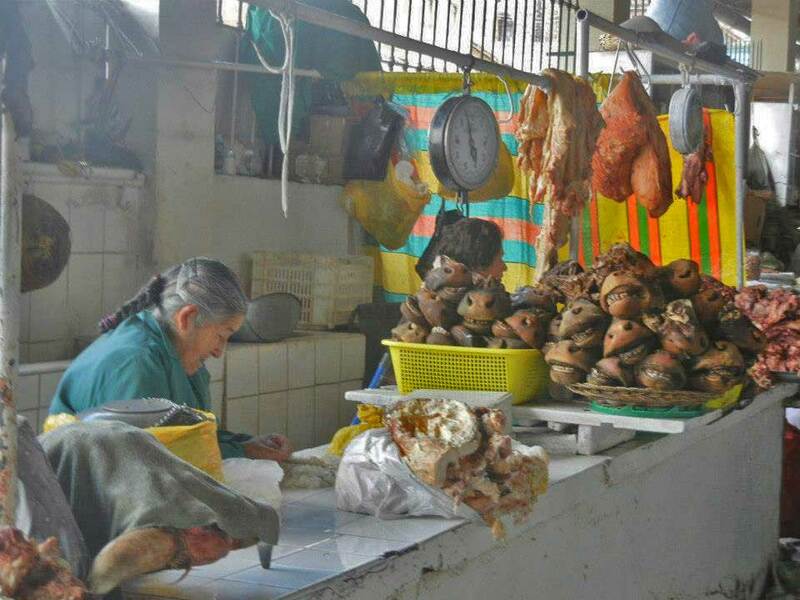 The ceviche is one of the specialties of Peru and it seems they are masters in making it here. It ‘s an upscale restaurant with a warm and cozy ambiance. Definitely to try. This is the only restaurant I could remember. it seemed a little high end, but it’s very laid back with great options for vegan and vegetarian. I loved the decorations and pictures on the wall. I love the places that combine art with food and create a warm and cozy ambiance where you look around and see beauty, smell delicious and tastes superbly. A total joy for the senses. This place seems one of those and I include it in my list. Cusco or Cuzco comes from the indigenous Quechua who called the city Qusq but its origin is found in the Aymara language. Source: Wikipedia. The city’s international airport code is CUZ. An estimated population of about 435,000. Situated in the south-east region of Peru, Cusco is the capital city of the Region and the province of Cusco. You will see them often wondering around isolated road. The original dialect is Quechua but the official and spoken language is Spanish. 1 USD equals 3.30 Sol at the time of writing. As in every touristic place, the best and safest place to exchange money is in banks. Altitude in Cusco is about 3.600 mt (12.000 feet). It takes time to get used to it. I remember panting while exploring Cuzco through the steep and cobbled stoned roads. All worth the efforts though. They would sell you coca leaves to chew or to make tea to drink. They even have chocolates made with coca. In my case, it didn’t help and I had to get to my old friend Paracetamol. But altitude sickness affects every individual in different ways. Just be mindful and listen to your body. They suggest spending a couple of days in Cusco before visiting the Machu Pichu so that you can use to the altitude. 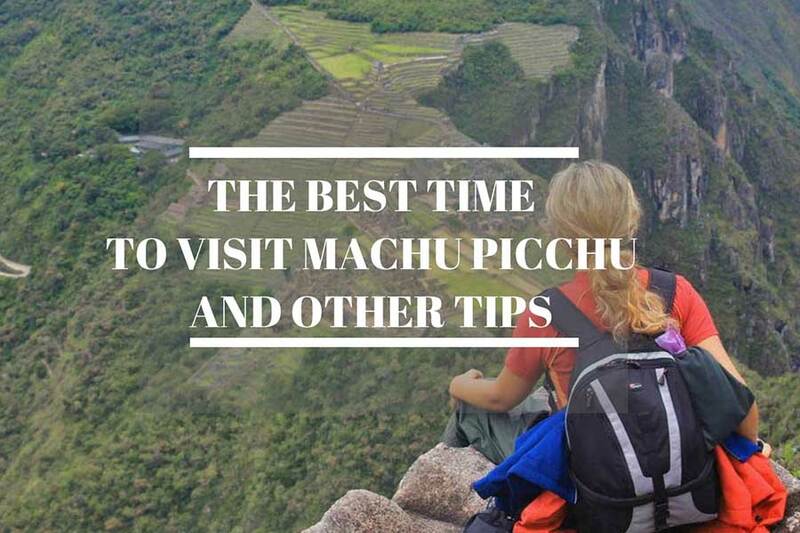 In fact, Machu Pichu is at a lower altitude so by the time you get there you will be fine. during the hike they say not to get any medicament so that in case of sickness the guide would be able to interpret the symptoms and advise accordingly. Temperatures go from 4º to 17º (39F to 63F) all year round except winter, in June and July from -3 to 17 (27Fº to63Fº). In the night the temperature drops significantly. Rainy season is from December to March and the rainiest month is normally January whereas the driest months are June and July. According to the weather, it would be June and July which would be colder but sunnier. However, those are the months with more tourism and more expensive rates. I went in March and although I got some good rain during my hike to Machu Picchu I enjoyed that it was relatively less crowded and warm temperatures during the day. 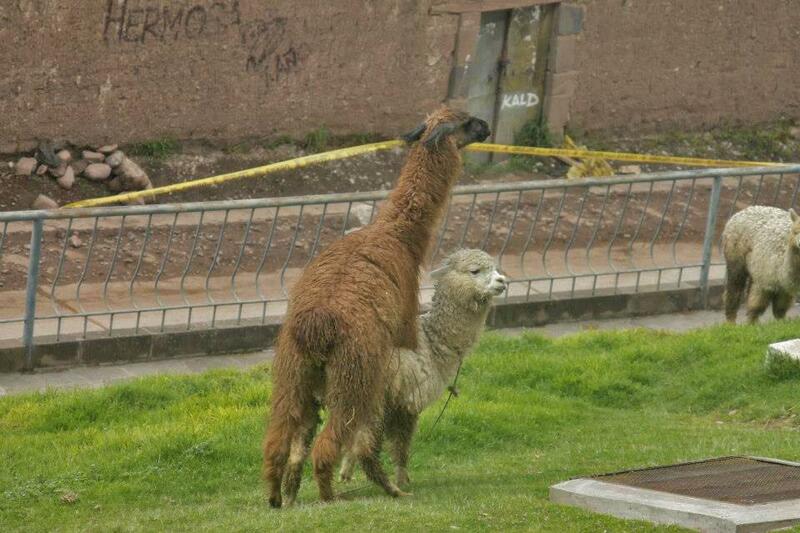 I didn’t actually perceive any particular danger in Cusco. However, unfortunately, there is a lot of poverty and lots of beggars on the roads, sadly the majority are kids who are sent by parents to beg for money. Who doesn’t melt at the pleading of those sweet pretty faces? It’s hard to resist to handing them some coins but I discourage you from doing it as you would support kids exploitation. It’s a huge problem. Also, as in all places with a high poverty rate street crime, including muggings and thefts are quite common. Use some common-sense rules like the ones I listed in this post and you will definitely prevent some unpleasant situations. 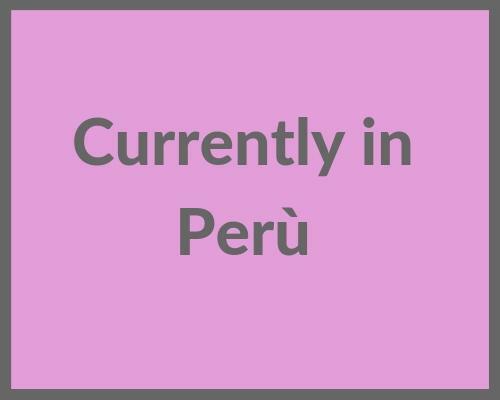 As all international flights get to Lima (although Cusco is considered an international airport but only flights from Bolivia gets there, all the others are domestic flights) you will need to find the best transportation option from Lima to Cuzco. You can opt for a longer but definitely more scenic Bus ride or jump on a plane and get to Cuzco in a blink of an eye. There is no better or worse it is totally up to you depending on how much time you have and what you prefer. If you have time on your side and decide to take advantage of a bus ride to see the beautiful Peruvian landscapes you can opt for the comfortable buses. There are a lot of bus company and different routes that take you to Cuzco from Lima and I have found a great guide to help you made up your mind. Click here to read it. You have a lot of options and chose from many different local airlines LATAM, TACA, StarPerú, and Peruvian Airlines, all have regular flights from Lima to Cusco and vice versa. As usual, I suggest you should check them all and chose what suits you best for their schedule and price. Prices range from 90 USD to 110 or more depending on time and airline. You can either click on the different airlines and check out prices or check an aggregator such as Skyscanner to compare prices. I would do both. TIP – Taxis from Cusco Airport to the city can be expensive. You can pre-book your transfer here, for only 7 USD. What is the touristic ticket? The touristic ticket ( Boleto Turistico) it’ a way to save money if you are planning to visit many places that imply an entry fee, including archeological sites and museums. As you could see there a lot of interesting places to explore and if you buy each ticket it would be much more expensive. On this site that I have found, you can check the price options and the sites included, and where to buy it. 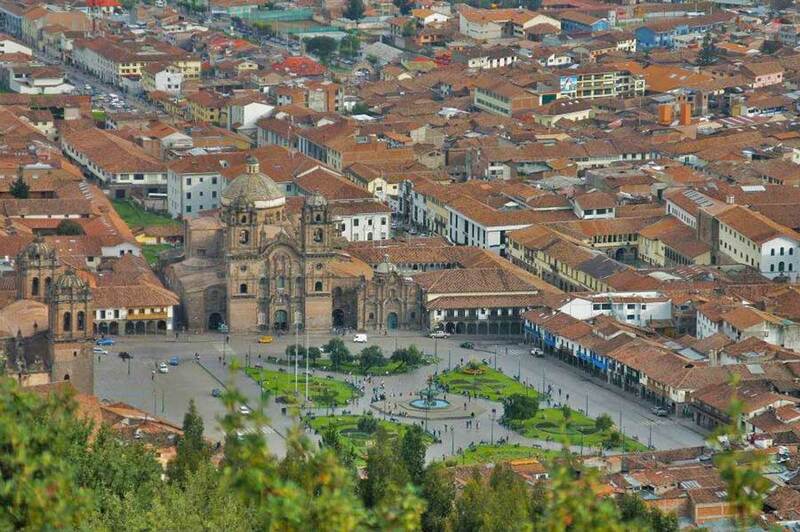 Did you know that the city of Cusco has been designed in the shape of a Puma? Somebody took the time to do some research about and here you can read what he has found. The inti rami is the most important celebration set up by the Inca civilization worshipping the God of the Sun and pleading him to continue to watch over them. It’s also called the festival of the Sun as they consider the sun as the most powerful God, responsible for their life and greatness. According to historical facts, the Inti Ramy has been suppressed by the Spanish conquerors who labeled it as a pagan festivity and therefore in contradiction with the Catholicism they were professing and indoctrinating. In 1944, the founding member of the Peruvian Academy of the Quechua Language, Faustino Espinoza Navarro, after a meticulous study on the original rite, brought Inti Raymi back to life. When does Inti Rami Festival takes place and where? Inti Rami is celebrated nowadays every 24th of June and it’s now the second most important festivals in Latin America, drawing visitors from all over the world who converge to Cusco either to understand and enjoy the colorful and exhilarating rituals or to participate and celebrate together the winter solstice as the beginning of a new year. 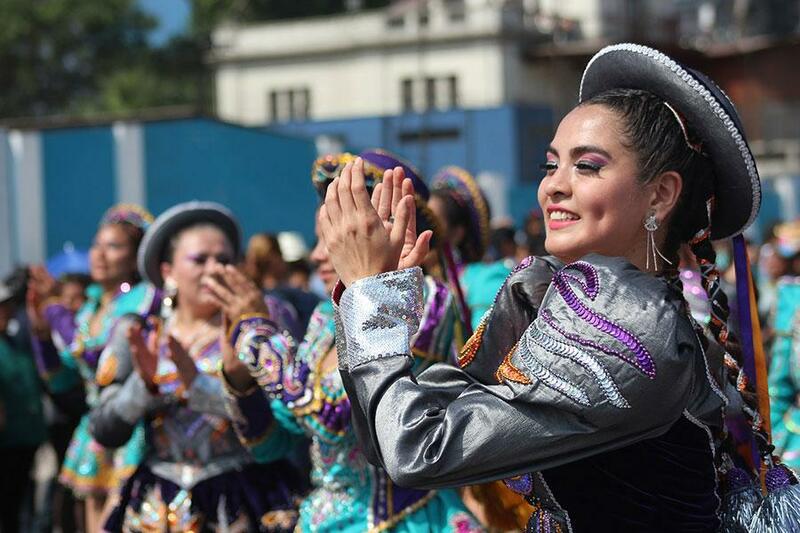 Each day of the festival has different celebrations, with expositions, street fairs, most of all dances and performances with actors and actresses in their colorful traditional costumes representing historical figures and their legendary accomplishments. In the evenings live music bands perform in Plaza de Armas offering free concerts to the merry population of any age and nationality. To know more about the history and the meaning of these spectacular celebrations, check out this post. The most important venue and the center of the celebration is Sacsayhuamán, the unmissable archaeological complex about two kilometers north of Cusco. Entry is free and rental chairs are available from booths around the main square. In order to avoid inconvenience if you necessarily need to stay seated, it’s better to book your seat in advance. There are also food and drink vendors on the grounds. As you can imagine Cusco is going to be packed and if you want to make sure you find a room, it’s better to book in advance. You can check here for availability. This time of the year seals the beginning of the high season with its peak right in these dates. 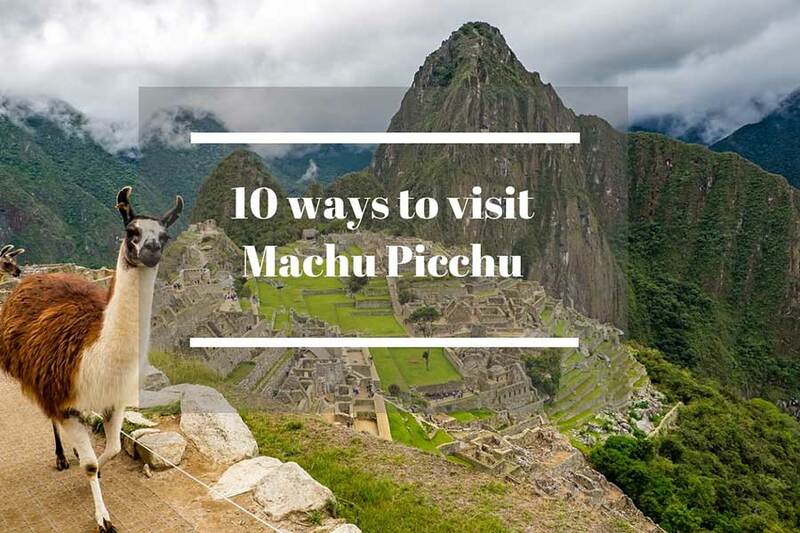 Which means that also for visiting the ruins of Machu Pichu or any other nearby site you are going to be with a lot of people and face higher rates in tours and accommodation. Remember to book in advance, especially if you wish to do the Inka trail. It’s dry season, with sun for most of the time during the day and cold nights. However remember we are close to the Amazon, which means don’t leave your rain gears too far from you.